The Monmouth County Park System has several publications and email subscriptions to keep you up to date on the latest offerings, happenings and developments in your county parks. Our Parks & Programs Guide is published five times a year, four seasonal issues and a special Summer Camp/Swim Lessons edition. 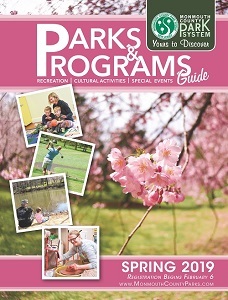 Each issue of the Parks & Programs Guide features a listing of recreational programs and special events. From pottery classes to nature walks, these offerings are a great way to meet people, explore new interests or develop a hobby. Sign up to receive our Parks & Programs Guide through the mail. Also published seasonally is our Green Heritage Newsletter. Filled with the latest park news, the publication also features Open Spaces, Livable Places; Home Gardener; and Nature Corner sections. Sign up to receive the Green Heritage Newsletter. Receive timely updates regarding Monmouth County Park System programs, special events and golf course promotions through a weekly email. Sign up for our general email or our golf email.